Am I Eating Right? What’s Left? When I was at the joint replacement clinic the other day, the nurse asked me if I was eating right. I told her about my battles with the crave monsters – I mean morsels. I told her about the nutritionist helping with the diabetic diet. I also told her I liked the white food diet but the first week or two were so hard. But my favourite diet was the “All You Can Eat Diet”. You don’t lose weight on it, and your heart probably cries all night ,but it could be really satisfying – goodful! Feeling are important in most diets – positive, negative, love, hate, anger, happiness, guilt, worry, anxiety, anticipation, and fullness. 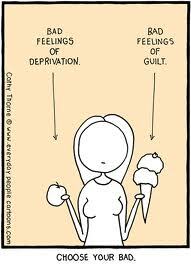 Certain foods affect your moods and the cravings can make you crazy. Chocolate is very, very good for you. But (and there is always a but) in order to feel less guilt, you have to only eat dark, 70% cocoa chocolate. Also to alleviate the global guilt, you must eat organic, free trade, local etc….. chocolate. It also has calories, which must be taken into consideration in the balance of your intake! I’m beginning to think I’m on a voyage of exploration to find the “rightness” of my eating. I know I need to eat 6 small meals/snacks a day. It’s OK to eat soup for breakfast! It used to be pizza (a complete food in itself but way too high in fat, carbs and calories – sigh) but there are fun alternatives. Think of the “breakfast for dinner” movement! There are now lots of restaurants that serve breakfast all day. Nice! So it’s OK that I put pineapple in my cottage cheese or red peppers. I feel right about all the carrot sticks (I’m too cheap to buy those preformed “baby” carrots and they taste funny, anyways) with the rich greek yogurt dip! 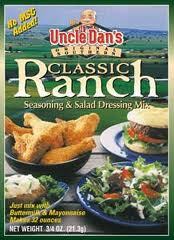 I love Uncle Dan’s – a little high in sodium but I’m weaning it down. It’s Ok that I make the odd latte with chocolate milk. It’s calcium! lettuce leaves make spectacular wraps! Well, some lettuce leaves do, try it. I refuse to get depressed or angry about MY choices. I will just do it. I think the hardest thing will be fitting the 8 glasses of water in between the 6 meals. My God, I’ll be consuming something almost every hour of the day! Continueating! Yeah, I’ll try that. I will make lists of what I DO like and pre-plan (I know, redundant, but i need to do things before I plan) menus and shopping lists. I like canned green beans, red meat, beets, quinoa, yams, sauces, cream of mushroom soup, Irish whiskey (not while on my meds or driving) and Red River cereal. I’ll work on this for a while and get back to you. If animals aren’t supposed to be eaten, then why are they made out of meat? ~ by 1fatgirlshrinking - Diane Kirby on April 26, 2012. Well if it makes it easier I’m a nutritionist and I live by the 80/20 diet. I eat healthy 80% of the time and cheat the other 20. Not big cheats but if I really really want cake I have some. Still don’t eat processed foods and fast foods but it’s more of adding the extras every on e on a while. Having a healthy mind is important too. It’s worked for me. I lost 70 pounds, kept it off for 3 years, my clients are all happy with it too. You only live once!! I like that! Friday is “Diane doesn’t cook day” and it would be nice to expand my allowables if it’s one day a week! And congratulations. I’m down 70 but still have 60 to go!